Impression of the work of the KNMI. Measurements are made with the high mast with measuring equipment near Lopik. Twice every day measuring equipment and a radio transmitter are launched with a balloon in De Bilt to make measurements at a height of a maximum of 30km. Also the new building in De Bilt, where all the measuring data comes together. 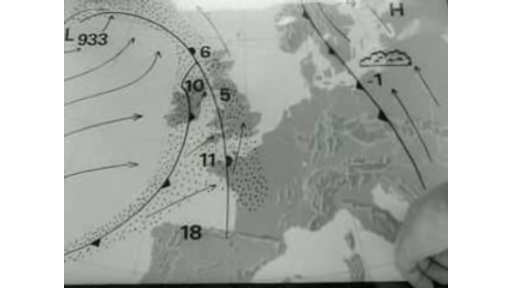 The messages are transferred to and received from other weather stations by telex. The data and satellite photo's are incorporated in a weather map. The weather forecast is recorded with a television camera and broadcasted on television. Also with a simulation of a weather satellite. With archive material of the industry, landing airplanes, road traffic in the fog and a tanker.